We all know that many people are not sure which are the best talents for their class and that’s why I’m making this post. I can say that I have a lot of experience playing with a MM Hunter and here you will be able to see the Hunter PVP Talents build that I use. Of course this is only my opinion about each and every talent choices and I can’t say that this will be the best hunter pvp talent build for you, but I can say for sure that with those talents you can make things work quite good in PVP. The other important thing that I have to mention is that I play mostly as a MM Hunter , so those talents are the optimal choice only for this spec. If you want me to make the Hunter PVP Talents build for the other specs, just let me know in the comments below. Posthaste is my choice from the first tier of talents. For me the freedom effect and the speed buff bonus are quite useful in PVP, because the help a lot with keeping good distance from your enemies. Of course this is helpful only against melee enemies. Binding Shot is my second PVP talent choice, because you can combine it with a Powershot and Explosive trap (with the push glyph). In arena you can CC the whole enemy team , if played correctly and in Battlegrounds – even more targets. You have to train a bit with the use of the spell, because at first it might be a tricky to use it fast and efficient at the same time. The other talents choices are also good, but they can’t be used for more than one target. Also the Intimidation talent is very depending on the position of your pet, so you may not be able to use it in the right moment. From the third level of talents I use Spirit Bond. You all know that those talents boost your survivability. For hunters sometimes is very hard to stay alive in long arena fights and I think that Spirit Bond helps a lot with this problem. Well if you don’t know how to keep distance and you to hide you probably won’t last long even with this talent. About the other two choices: Exhilaration is very strong, but it has a long cooldown and Iron Hawk is also good, but for me the healing over time effect is better than the damage reduction bonus. Again only my opinion. Thrill of the Hunt (makes your Aimed shot cost 20 less focus) in combination with Rapid fire can produce great burst of damage. I don’t have any comments for this Talent, because I think that most of you will agree that the other two choices are good, but this one is few times better. A Murder of Crows – here I have few things that will bac up my choice. Good damage over time with decent cooldown compared to the Stampede talent. Much better for MM hunters than Blink strikes( which is better for BM hunters). I can say that for me it’s the most balanced choice and If you manage it correctly A Murder of Crows can be out of cooldown all the time. 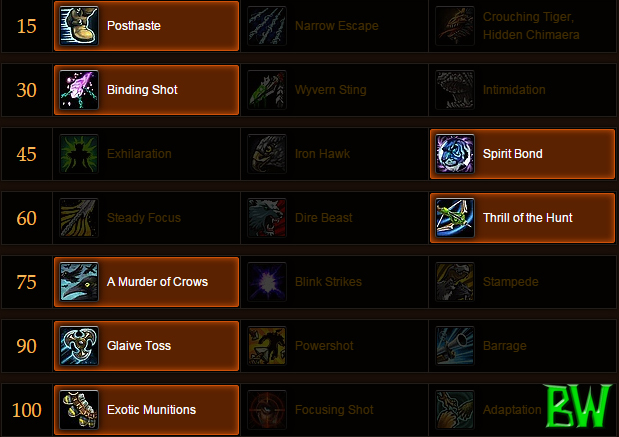 Glaive Toss is my choice,because it has very low focus cost, very low cooldown, instant cast and decent damage. In some cases Powershot is better for the interrupt effect, but in general for me Glaive toss is better. My final choice is the Exotic Munitions talent. I just don’t like any of the other two talents for PVP, because Focusing Shot require to stand still and I really don’t like the idea of Lone Wolf. Also if you use Lone Wolf you won’t be able to use Roar of Sacrifice and Master’s Call and this will make you a “glass cannon”. In conclusion I must say that this Hunter PVP Talents build is one of the many. The most important thing is to create your own playstyle and get used to your character. After that you will feel which of the talents match with the way you play. I hope that you like this article and I will be very happy you see your opinion in the comments below.